Preheat the oven to 180°C (350°F/Gas 4). Rub the capsicum with oil and place on a baking tray. Roast in the oven for 20–30 minutes, or until the skin blisters. Place the capsicum in a plastic bag and seal; the steam helps to loosen the skin. Peel the capsicum, discarding the seeds, and cut into 1 cm (½ in) slices. Set aside for later use. Meanwhile, heat a large ovenproof casserole dish over medium–high heat. Add a splash of oil and cook the lamb in batches, until brown all over. 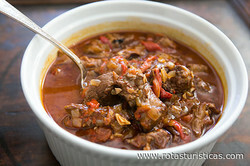 As it cooks, transfer the lamb to a warm plate and cover to keep warm while you cook the rest. Return the casserole dish to the heat. Add more oil, if needed, and cook the onion for 5–6 minutes, until soft. Add the garlic, paprika, saffron and bay leaves and cook for 1–2 minutes, until fragrant. Add the wine, bring to the boil and cook until reduced by half. Add the stock and tomato purée and bring to the boil. Reduce the heat and simmer, covered, for 20–30 minutes. Return the lamb to the dish and season with the salt and pepper. Cover the casserole and cook in the oven for 1½–2 hours, or until the lamb is tender. Add the reserved capsicum slices and season to taste. Delicious with couscous.